In 1946, James King went into business with Homer Johnson and the two men established King and Johnson appliance store located at 215 North Buckeye Street in Kokomo. They began selling Kalamazoo furnaces in the early days of the business venture. In 1948, James purchased Homer's share of the business and changed the name to King's Kalamazoo Store. James, and his wife Edna, ran the business with help from their sons, Ronald and Roger King. In 1961, the business relocated to it's present location at 115 East Vaile Avenue. After James retired, Ronald assumed operation at King's and Roger was involved with inside sales for the company. In 1965, King's was incorporated under the name King's Heating and Plumbing, Inc. The business has been guided by the third generation of the King family since 1992. 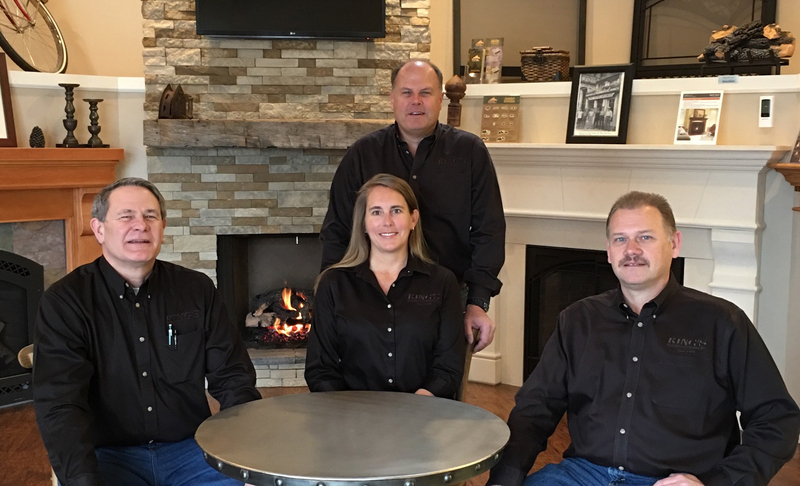 Jerry King (President), Jay King (Vice-President), Rick Newton (Vice President) and Terri King (Secretary/Treasurer) compose the King's Heating and Plumbing, Inc. management team. Rick Newton is currently the only stockholder in the company outside of the King family. What once was a one truck, two man operation has now grown to 21 trucks and 27 employees. King's is grateful to have such a loyal group of employees that have helped King's provide quality service to the Kokomo area since 1946.
and had some to give and most years it has grown a little. We have enjoyed serving the people." -written by James King, founder of King's Heating and Plumbing, Inc.